No, no, no, that can't be right. 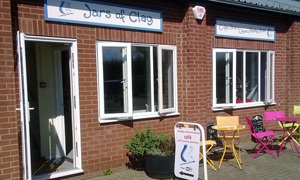 I've just now looked up when the Light Lunch team jollied along to Jars Of Clay in its previous home in that Woodbridge. 20th of the month, yes. July, yes. Wet day, yes. But 2007? Seven years ago? No, no, no. Can that be right? Fed up of the perenially soggy conditions in the 'Bridge, JoC has ridden its potter's wheel out to a small and sunny Rendlesham business park. Better parking, larger area, improved climate. Not quite sufficient solar power to tempt us outside to the pink and yellow seating: there's plenty indoors. On what could be that dreaded last day of the summer hols, some kids are spashing paint on some saucers (not far to the UFO trail). Kev, frustrated artist that he is, is very tempted to decorate an owl. What's on the menu? Same as last time. Toast. Just toast. White or brown and you get to express yourself with your choice of topping. Pate for one, pate for all. Friendly young lady uses half a loaf and brings us some good sized pate slabs. Limited choice can, at times, be cleansing for the soul. Accompanying bottled raspberry smoothie is super fruity though the contents resemble tidy-up time at the after school art club. If we weren't discussing creepy Worzel Gummidge and scary Catweazel, we'd be taking advantage of the free WiFi and many mags. Only me for a jolt, a half-decent Paddy & Scotts latte with, on the side, a rather scrum Twistie biscuit stick. And, slightly further to the side, a vg slice of carrot cake from the under the counter sweet trolley. If you're in the area as part of SETI and in need of a beam-me-up, direct your tractor beam this way. If it was a car -- Triumph TR2. If they were passing by -- Paul Young.